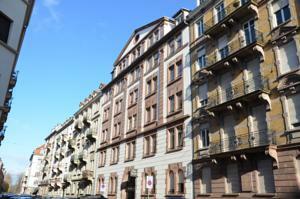 Cap Europe, your hotel residence in the center of Strasbourg, close to the European Parliament. Accommodation in rooms and apartments ready to live. 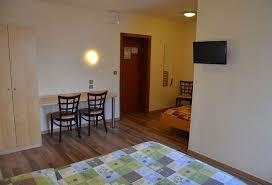 Cap Europe offers you different types of rooms, studios and apartments that can accommodate from 1 to 5 people. The single room has a TNT TV and a bathroom with shower and toilet. One single bed. The double or triple room is a comfortable room for 2 or 3 people. It has a TNT TV and a bathroom with shower and toilet. This room offers a superior range without a kitchenette. 3 single beds or 1 double bed and 1 single bed. The studio sleeps 1 to 2 people and has a TNT television, a bathroom with shower and toilet and a kitchenette corner with electric hobs, refrigerator and dishes. Bright and quiet ... ideal for a stopover in Strasbourg. 2 single beds or 1 double bed. Spacious and bright, the upper studio has a surface area of ​​20 to 30 m² and accommodates 1 to 2 people. It has a TNT TV, a bathroom with shower and toilet and a kitchen equipped with electric hobs, fridge, dishes and microwave. 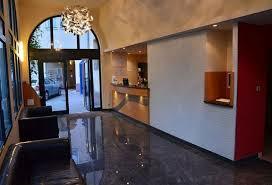 Very good amenities to spend a pleasant and comfortable stay in Strasbourg. 2 single beds or 1 double bed. The apartment has an area of ​​30 m² and accommodates up to 3 people. It has a TNT TV, a bathroom with shower and toilet and a kitchen equipped with electric hobs, fridge, dishes and microwave. 3 single beds or 1 double bed and 1 single. The apartment has an area of ​​30 m² and accommodates up to 3 people. It has a TNT TV, a bathroom with shower and toilet and a kitchen equipped with electric hobs, fridge, dishes and microwave. 3 single beds or 1 double bed and 1 single. The 4-person apartment with 1 bedroom has a TNT TV, a bathroom with shower and toilet and a kitchen equipped with electric hob, fridge, dishes and microwave. It consists of the main room with 2 separate beds and a room with a double bed. 1 double bed and 2 single beds. The apartment for 5 people with 2 bedrooms has a TNT TV, a bathroom with shower and toilet and a kitchen equipped with electric hobs, fridge, dishes and microwave. It is composed of the main room as well as a room with 2 separate beds and a room with 3 separate beds. These 2 rooms are communicating or integrated into a large apartment. 5 single beds or 1 double bed and 3 single beds. - The cultural news in Strasbourg on the cultural agenda to know everything about Strasbourg (gastronomy, monuments and museums to visit ...). - The Zenith: the program of concerts around Strasbourg. 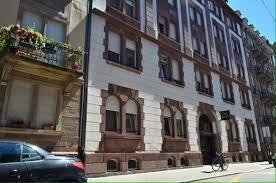 - To know everything about the Bas-Rhin: the tourist development agency of the Bas-Rhin. - To know all about Alsace: the Regional Tourism Committee. You can also explore the thrill of the Europa Park theme park. Other part: 60 boulevard Clemenceau. Café de la Paix: 4 rue Strauss Durkheim. Empire Steak Pavilion: 68 boulevard Clemenceau. The King: 28 rue Sellenick. The Meating: 5 rue Hirschler. Not far from the corner: 1 Schimper street. Sushi Burger: 58 boulevard Clemenceau. Thousand Flavors: 17 rue Finkmatt. Matthias: 17 alley of the Robertsau. The Matthias: 11 Schwendi Street. Shem Tov: 6 rue du Maréchal Foch. Délices Hide: 82 boulevard Clémenceau. Hide Space: 2 Black Forest Avenue. All restaurants are closed on Saturdays. Meals can be purchased at Mille Saveurs and at Le King. Jewish Community of Strasbourg: 1 rue René Hirschler. Tel: 00 33 3 88 14 46 68. Etz Chaim: 7 rue Turenne. Tel: 00 33 3 88 24 02 30. By plane: take the shuttle from Strasbourg-Entzheim Airport SXB. By train: come by tram or bus from the station. The nearest tram station is Parc des Contades, Line B/E. Paris: A4 exit Strasbourg Center Wacken, Avenue des Vosges. Colmar: A35 exit Wacken-European Institutions, Avenue des Vosges.